Having a car that was issued by large companies such as Toyota has become a matter of pride. As we know if Toyota's car output is famous for its strong durability and also with a recalcitrant engine. Not only for new cars, Toyota any brand with the former condition and still has many takers. For example, Kijang Innova, which is a favorite for those who need a family car. This car has a strong resistance. Rarely is broken and does not spend a lot of money to maintain. And other types. Therefore, note the date limit of each oil and replace it in time. The second thing you should notice is the maintenance on the vehicle battery. Cars must use any kind of battery. Do not forget to check your car battery so dry. If dry it will be damaged and require no small cost. If you do not want trouble then you can choose a dry battery that can last up to 4 years. In addition to oil and batteries, there are other things you should consider, namely the state of the fan belt which often damaged or even broken. When there is a loud buzzing noise from the front of the hood then chances are your broken fan belt. Also do not forget to take care of the state of the wheel. Toyota car known strong and rarely had problems with the wheels. Only when the age of the car is getting old, then condition the wheels and also the place where the wheel is mounted should be a concern. Although the Toyota cars that you have is a used car, but love your car and treat it well. Do not forget to always make sure, if the water radiator is always within the limits should be. Also for the condition of the brake and clutch linings do not get out, because it will make the metal around it becomes worn or damaged. 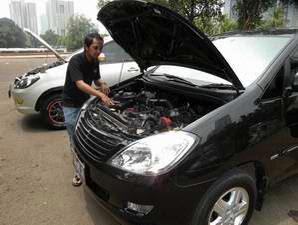 Checking the state of the machine to perform routine service also good tips for caring for your used car. It is not possible if your used car is more look like new than a new car out of the dealer.